1. Preheat the oven to 220ºC, gas mark 7. Wrap each beetroot in foil, place in a roasting tin and bake for 30–40 minutes until tender. Unwrap and cut into quarters. 2. Meanwhile, mix the cheese, crème fraîche, tarragon, oil and seasoning. Toss with the warm beetroot. 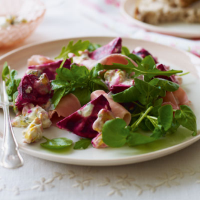 Arrange the ham and salad on serving plates and top with the beetroot. Serve with walnut bread. You can use Parma or Serrano ham in this salad. For extra convenience, use ready-cooked beetroot and serve the salad cold. Blue cheese works brilliantly with a bright Sauvignon Blanc, and I can think of nothing better with this salad than the zesty Rabbit Row Sauvignon Blanc 2010, Marlborough, New Zealand. This recipe was first published in Tue Mar 01 11:25:00 GMT 2011.